Oriental rugs have long been considered as the ‘royalty of rugs’. In ancient times wool and silk area rugs were crafted for royal families who ruled the regions of Asia, China, Iran, Turkey and other Persian territories. Today, these decorative items for the floor have become more than just a floor embellishment. Many are passed down for generations and become heirlooms. Others are investment pieces purchased for their beauty, some are prayer rugs and others are just the perfect complement to a room in our house. Handmade rugs are religiously woven and crafted using fine wool and silk by artisans using skills that have been passed down for generations. A typical handmade 8X10 hand-knotted wool rug can take 18 months or longer to make therefore these type of rugs are naturally more expensive than those manufactured by a machine. Rugs are not all the same! – In this section, we explore the construction of a hand-knotted rug. We also highlight characters of the imitation rugs; hand-tufted and machine-made rugs. The pattern is almost as clear on the back as the front side of the rug. The depth, clarity, and density of the design are unmatched by any other rug type. A – Warp, Foundation of the rug. Parallel threads running through the entire length of the rug which knots are tied. 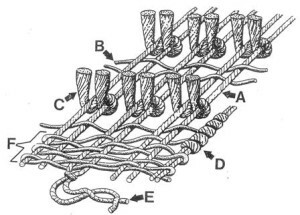 B – Weft, Strength element for the rug. Threads are woven across the width of the rug inserted between all the rows of knots. Weft threads pass through alternate Warp threads. C – Knot, Main part of the rug. A strand of wool or silk is looped around two adjacent Warps and then cut to form the surface of the rug. D – Overcasting, Also referred to as the binding. Yarn is wrapped along the length on both sides of the rug to help keep the knots secure. E – Fringe, The visible continuation of the Wrap threads at both ends of the rug. The length of fringe does not signify quality. The word “hand” in “hand-tufted” is used in describing this type of rug to give a false illusion that the rug is handmade. The making process uses a tufting machine to insert the yarn to a grid-work backing, then glue or latex is applied to the back of the rug to hold the fibers in place and finally a fabric is applied on top of the glued portion for a neater appearance. The fibers used to produce this type of rug are lower grade. This type of rug does not clean as well as other types of rugs. The glue applied to the back can get dry and brittle over time. Significant shedding and burned rubber smell are also common with this type of rug. 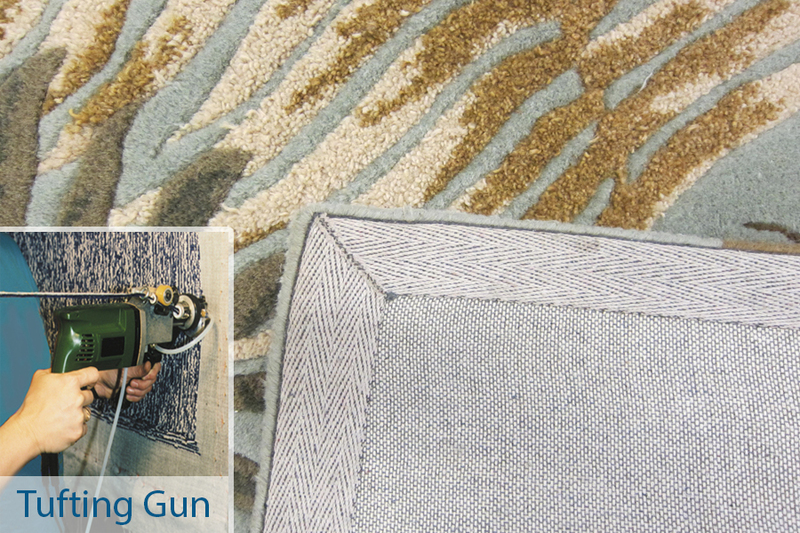 A machine made rug is a much better alternative to consider for about the same price as a tufted rug. 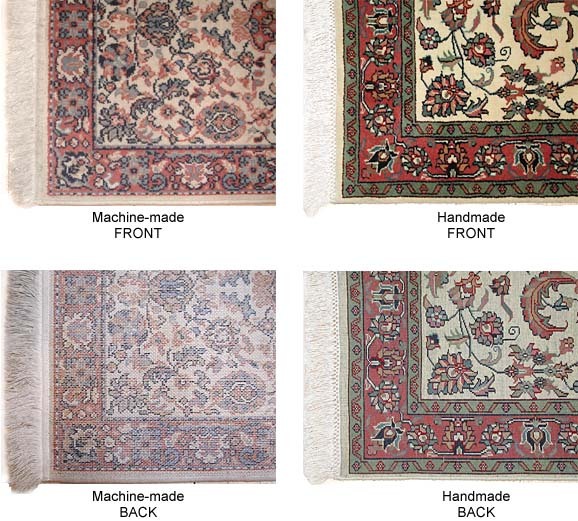 Can you spot the difference between a hand-knotted and a machine made Oriental rug? The construction of the machine-made rug is very different from the handmade rug. There is an overstitch pattern across the whole back of the machine-made rug. You cannot easily distinguish individual knots on the back of the machine-made rug because there aren’t any – the overstitch construction is what holds the pile material in place. 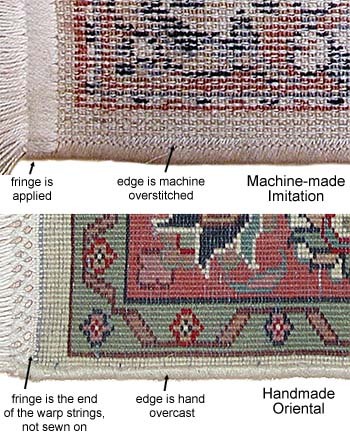 The fringe is clearly stitched to the end of the machine-made rug after it’s complete, whereas the fringe of the handmade rug is actually made up of the warp strings that come out of the end of the handmade rug. The biggest complaint in the industry is the ongoing effort by machine-made manufacturers and retailers to blur the difference between their product and genuine hand-knotted rugs. We’ve seen instances of manufacturers affixing a sticker to the back of an area rug claiming the rug is “handmade” when in fact it is “hand-tufted.” The difference in price between a real “handmade” and “hand-tufted” Oriental, wool or silk rug can be several thousand dollars. Over the years we’ve talked with lots of people confused about what they bought or were given. Machine-made rugs have their place, but learn to identify them so you can be sure about what you are examining or being offered. Continuing confusion for consumers and untrained rug dealers results from the common use of “Oriental rug” as a generic label for nearly any variety of “Oriental design” carpeting. Furniture stores, carpeting dealers, auction and estate dealers and some large home improvement stores sell a constantly changing mix of machine-made and hand-made rugs which they often lump together and advertise as “Oriental rugs”. Sadly we’ve seen some salespeople with little to no knowledge about hand-knotted rugs who cannot distinguish the difference between a hand-knotted, hand-tufted or a machine made rug so they lump all rugs into the “Oriental handmade” category. Many consumers have overpaid thinking they have a real “hand-knotted Oriental Rug” when in-fact they have an inexpensive tufted area rug. For most dealers in genuine Oriental rugs, an “Oriental rug” is defined as a piled or flatwoven fabric hand-knotted in one of the traditional weaving areas of the Middle or Far East. Genuine “Oriental rugs” come from Afghanistan, China, India, Iran, Nepal, Pakistan, Tibet, Turkey, some of the southern territories of the old Soviet Union (like Azerbaijan or Armenia), Balkan countries like Romania and Albania, and some North African countries like Morocco and Egypt. Genuine Oriental rugs are not made in Belgium or anywhere else in Western Europe or in the United States (there are hand-woven rugs made by native Americans in the American Southwest, but these are called “Navajo rugs” or “American Indian rugs”). Wilton®, Karistan®, and Couristan® rugs are rugs made by machine in Oriental rug designs; they are not “Oriental rugs”. No genuine Oriental rugs are made of nylon or polypropylene.